Smart Thermostats for High Voltage Systems: What are your options? When we think about high voltage systems, smart thermostats are not something we relate the term with, much less automation in general. Energy efficient and at your beck and call, a smart thermostat can make your life easier even when controlling high voltage systems. 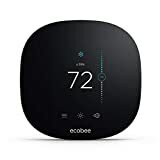 The ecobee4 Alexa-Enabled Thermostat rarely makes the top of any list regarding smart thermostats. 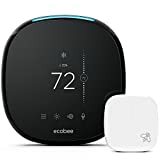 However, ecobee4 is evolving into a leader in automation. High voltage systems work in tandem with the newest model of ecobee4. The customized settings that the ecobee4 offers is a draw for those with specific needs. Nest always is an option. The evolution of their smart thermostats has been exciting to follow. The 2018 Nest Learning Thermostat 3rd Generation is not only compatible with high voltage systems, but it works as your best friend who is an agoraphobe and never leaves the house. It learns your habits and is controllable using smartphone applications when situations arise, and you need to change the settings. If you are in search of a mid-range appliance, Nest has also come out with the Nest Thermostat E. The active features of the Thermostat E is enough to automate many people’s lives without the more massive cost. The ease of use and installation of the mid-range model is also appealing to those who not want full automation, or are not tech savvy. No option list is complete without mentioning Honeywell. Their newest innovation is the Honeywell Lyric T5, knows when you are home or away. It not only high voltage system enabled, but it also throws up a geofence that makes life easier. 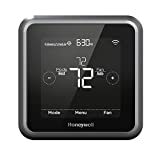 [Honeywell Lyric T5] Has all the necessary tools to extract the majority of possible smart thermostat savings without the high initial cost of a premium unit. Northern states in the United States tend to have high voltage heating systems. Many high voltage systems are baseboard heaters throughout a home. However, in-floor heaters and forced fans are not abnormal for high voltage systems. The fallback of a high voltage system is that there is a thermostat in every room. But, if that is how your home is made up, how is that your fault? The cost to automaton may be more significant, but the savings are huge in the long run. Seeing a positive return is what most of us want. With options available, you no longer have to search in vain for smart thermostats that are high voltage compatible. Each year, the technology evolves to add more. It includes both types of systems. Each thermostat will require the update. But, there are people more than willing to help you before you pull your hair out by the roots. Wi-fi capable smart thermostats are a dime a dozen. But, other features perhaps will spark your curiosity when looking for a smart thermostat that works with your high voltage system. Do you need or want a geofence that knows when you are home or away? Do you want the ability to set your thermostat when you away? Energy efficiency is a dual benefit. Becoming more green while holding onto your paycheck may be a long-term draw. Do you want your thermostat to log how much energy you use to examine the efficiency? Do you want your smart thermostat to become integrated into other automation? We at Protect America will answer any and all questions while assisting with step-by-step instructions on how to install your new smart thermostat. No question is considered dumb, and all queries are treated professionally and with respect for your safety and comfort.